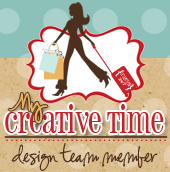 Hello to all My Creative Times friends! Happy Wednesday! I hope you are having a fabulous week so far! Last Friday was the kids last day of school and I wanted to make something special for my daughters teacher. It took me a little while to make but it was well worth it. I love this paper line and I love that MCT stamps go perfectly well with them. I used the My Teacher Rocks Stamp Set. How perfect is this???? I used the stamps throughout the album. I also used MCT Rolled Flower Dies on my front cover! I hope she loved it as much as I did! I did a tutorial on this album a while back but I have to give credit to my sister-in-law who taught me how to make them. Here is the tutorial. Make sure you mute the music down below. Thanks for stopping by today! I hope you have a crafty day! Hugs!! Love this album...love the shabby vintage look. Okay, I want your daughter in my class!!! This is absolutely beautiful and a gift her teacher will always treasure!!! nancy, you amaze me with your mini's! I don't know where you find the time to get these big projects done!! just stunning! That is beautiful, so many details. I love it. I'm sure the teacher went crazy over it. Fantastic. I was just going to say what Katie said ~ except I am NOT a teacher! This is just A BEAUTIFUL and WONDERFUL gift to give your daughters teacher or anyone! I am ALWAYS is AWE of you minis and I can't even imagine how much time this took to make! Every single detail ~ like ALWAYS ~ are just AMAZING! BRAVO Nancy ~ this teacher is going to LOVE it! I knowI would! Love your project. Graphic 45 papers are so great. Watched the tutorial. Thanks for sharing. I plan to give this a try. What a great job! Such a neat project. Great tutorial too! If that's what your child's teacher gets, what about your friends? It's so cool, so awesome. Beautiful job on this mini album. I like the folder idea.